Get Help with No Obligation . . . Contact or call (702) 523-0247 for Google Places help and answers now. Hands down, a well-optimized Google places listing is the most important advertising venture you will ever perform online for your business if you serve customers locally. Why? Because with very few exceptions it will convert into real business, real sales, real clients and customers visiting or calling you nearly 100% of the time. But as with all things "free" you get what you pay for. While you may have given your all to your Google places listing as a business owner, if you're not ranking within the top 7 or higher on Google's main page, the chances of gaining any real business from it are very, very slim. What's more, if you run into any problems with your Google places listing (and there are one thousand and one things that can and do go wrong, all the time) the amount of help and technical support available from Google is equal to the amount you paid for your listing. i.e. absolutely nothing. It's worth it to pay a professional to service and optimize your Google places listing because the payoff can be phenomenal. But two main issues stand in your way. The first is finding someone who really knows what they are doing. The second is finding a Local SEO professional that isn't out simply to rip you off . . . In terms of online advertising (and no matter what the reps from other online advertisers may tell you), Google places isn't just the best game in town, it's the only game in town. Over 90% of people searching will simply not look any deeper into the results than those displayed on page one. A Google representative told me this summer that if Google were to offer technical support for Google places, they would have to hire more than ten thousand people just to begin to scratch the surface, and that's just never going to happen. One client told us in the last year he has literally profited over $240,000,00 from his Google places listing since we optimized (for a part time service!). While not all success stories can be said to be quite as dramatic, each and every time the results have followed in proportion. From day one of our mastery of Google places optimization we committed to not charging customers anything more than some good quality work was really worth. If you pay a plumber to fix your water faucet or set you up with a new shower head, you don't owe him a dividend for every gallon of water that flows out of it, or a "monthly fee" for as long as it simply keeps working. In reality Google places works much the same way. If our Essential Optimization Package for Google Places is not enough to get you to where you need to be, then we offer all of the additional services necessary to get you there in time. From enhanced local directory listings that will put your best foot forward everywhere, to "niche" directories that will add even more power to you ranking status, to long term, ongoing local SEO work that might be needed to get you what you deserve in highly competitive markets. We, however, have regularly found tremendous initial success for our clients over the last three years - at a rate greater than 95% - from our simple, one time, professional Google places optimization service. Google Places repair, optimization and enhancement. And we'd like for you to be next . 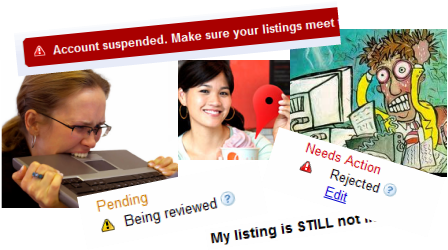 . .
Google Places repair, optimization and local directories enhancement. Optimized on Google Places in 48 hours or Less . . . If you're tired of being left out of the pack, struggling to do it yourself, getting screwed over by unsavory and fly-by-night SEO companies, or are simply ready to jump start your business online once-and-for-all, now is the time to do it. Our Essential Optimization Package for Google places is designed to cut through all the confusion, get right down to the heart of the matter, and give you what you need in a very short amount of time. We can usually begin showing you real search results in less than 48hrs. 399.00, one time, one year customer service. This package includes the one time professional optimization of your Google Places listing, plus data provider feeds for increased stability and ranking power long term. It will include fixing any existing issues that might need repair and comes with a guarantee of customer service for up to one year. To purchase, click buy now to pay through PayPal. You will then be redirected to our business info submission form page. After you've told us just a few things about your business, we will be contacting you promptly to get your work started. Not ready just yet to click the button? That's fine with us! We believe earning your trust is the best way to grow any new business relationships. 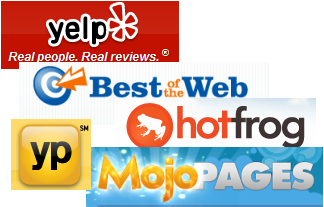 Over 100 local directories with complete business info and more for increasing Google Places ranking, links to your website, and local online presence long term. The more local directories both Google and potential customers can find you in, the better your long term rank and stability, and all the better for your business. Get listed everywhere with complete business info, social and site links, keywords, categories, photos and more. 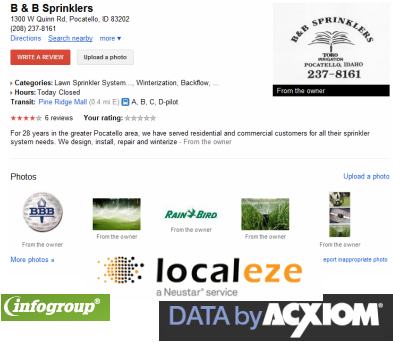 Search and submit your business info to any applicable local niche directories for significantly increased citation value and ranking. 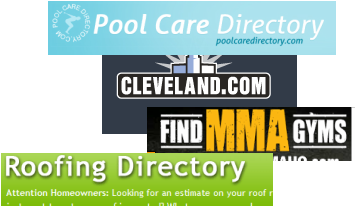 Depending on your field of business, there may be any number of local "niche" directories online that are available to provide list your business in. Niche directories are online local business directories that are specific to your field of work (e.g. roofing, restaurant, pool care, Realtor, etc.) and/or city, region or state (e.g. local news papers, state directories). 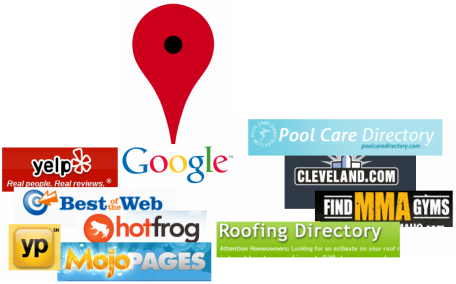 Since, unlike the national directories, these websites target your specific region or niche, they can provide 2xs - 3xs the value to your Google places listing when discovered and cited by Google. Save almost 150.00 and get the full nine yards and then some, with all of the above services at once and more. 849.00, one time, completed within 2 weeks with full status report. To purchase, click buy now to pay through PayPal. You will be redirected to a business info submission form page after where you will tell us a few things about your business and we will be contacting you promptly to get started. Is your Google Places listing screwed up? Has it been so long you feel nauseous? Often we can repair for free . . .!